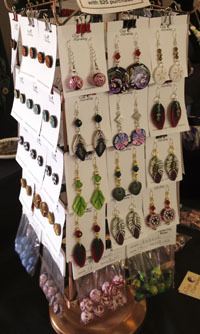 I’ve added a new “product line” at my craft shows – earrings! They’re inexpensive and so much fun to make. And they’re guaranteed to be something unique that’s not available at the mall. Each pair is slightly different (except for the little basketball and soccer ball post earrings). They all have either sterling silver or gold-plated earwires, and the post earrings have surgical steel posts. I had this fabulous bronze display carousel that’s perfect for showing off quite a number of earrings, so it now has a prominent place on my table at craft shows. I think I’m getting addicted to making them, so look out for new designs at a craft show near you this holiday season!